EWSCC - What Cricket Club is that? 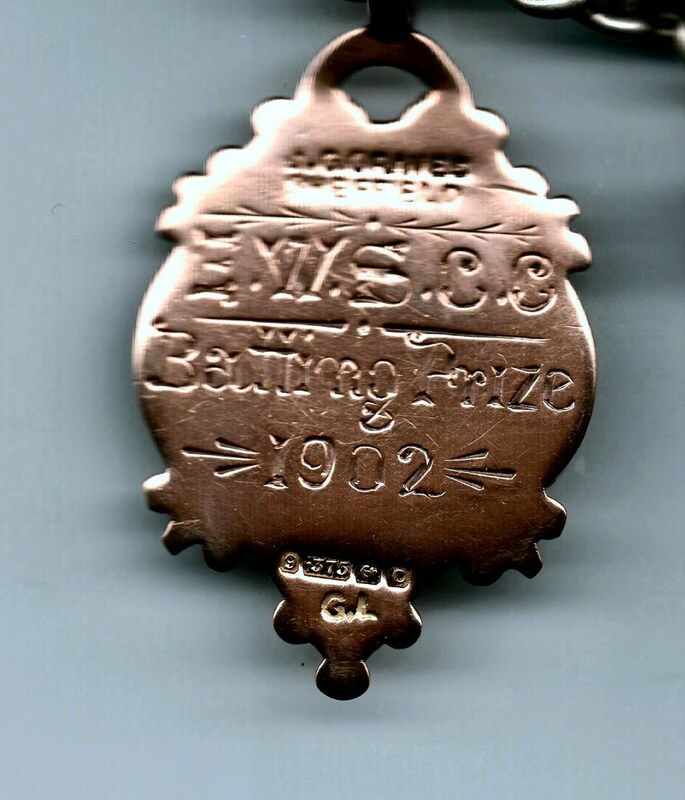 My Grandad William Morris had the gold medalion below on his pocket watch chain.Its hsows he won the batting prize at EWSCC (ie EWS Cricket Club) for season 1902 at the age of 18. IN 191 he was working as a heating engineer & lived at 61 Sellers Rd. Between then & 1911 he went to work at Sheffield Gas Company as a gas fitter . Doieds anyone know please what Club EWSCC was ? Quite a mystery this one johnm , I think even the experts on here have been stumped by it previously ( edit, no pun intended ). Have you any more information about your Grandad that might give more clues. Also I can't place Sellers Road, could it be Sellers Street, or if not do you know where Sellers Road is or was please? Hi boginspro . .having looked at street directories I think Sellers Rd & Sellers St are the same . In the 1901 census its down at Sellers Street & is off Aizlewood Rd but a later map shows the same as Sellers Road. It runds parallel to twon end of Abbeydale Rd . The only possibility I have come across is that there was an Exchange Cricket Club functioning in Sheffield at the time he won the medallion. I think it had a ground at Park Hill Lane. I believe that all these clubs did exist, though their names were fluid. Was Mr Morris living near any of them? Thanks johnm , I could only find it referred to as Sellers Street. I knew the area quite well many years ago having lived not far away as a kid in the 50's and visited family round there for years after that. I also worked not far away in the 60's. I may be wrong but I think your Grandads house would have been relatively new at that date, I believe that area was only developed in the late 19th century. Back to the medallion, Wesleyan was also one of the first W's that sprang to my mind, I seem to remember you mentioning previously your family having been associated with Wesleyan Chapels. Thanks Edmund. William was the first Secretary of the Ebenezer Wesleyan Reform (Bramall lane) Cricket Club but it was only formed in 1906 . He had attended there with his family from being a child & was only 18 in 1902 when he won the batting prize. I guess his dad must have been a cricketer but have no evidence of that. His dad was a Wesleyan Reform local preacher so it may be that he sent William to Ellesmere to play cricket although it was a distance from where he lived. Endcliffe would have fitted perfectly if it had started earlier ! Thanks Boginspro. Yes family was heavily involved in Wesleyan Reform Church. Both his dad & uncle were local preachers at a Wesleyan Methodist church (don't know which one) when they moved to Sheffield from Nottinghamshire about 1863 but in 1876 joined Ebenezer Brammall lane Wesleyan Reform Church when it was built. The medallion is gold & that suggests the Club was one which was well established & had resources. That's why I wondered if it was Exchange CC as I know from press reports it isssued gold medallions to players in 1902 although in all resports it's referred to simply as Exchange CC which doesn't really fit with EWSCC. Probably I won't find the answer with any certainty although Edmund has a psossible with Ellesmere Wesleyan Sunday CC which could fit although did they issue gold medallions ? I will check presss reports for them. Many thanks to both you & Edmund .